Okay, so this post is totally vain and absolutely not thought-provoking (unless you want to debate on a better use of my $35 every three weeks). It is however, a matter of utmost importance in my life at the moment. I am completely in love with gel nail polish. As a Mum, it couldn't be better: it stays on for 2 to 3 weeks without chipping or coming off. It's laundry resistant. It's dish-washing resistant. It's cooking resistant. It's "I wash my hands 50 times a day" resistant. And did I say it looks perfect for 2 to 3 weeks?? As a Woman who is a Mum, it's a winner too. Let's face it, who has the time to re-apply nail polish every two days? I certainly don't. And the frustration of taking the time to apply it to then see it ruined within 24 hours is just plain depressing. And I just can't stand the "chipped nail polish" look. What's more, I don't put make-up on every day. My hubby doesn't like me to (I know, lucky me! ), and again, I have no time. Or rather, I prefer to stay in bed 15 minutes longer instead of getting up earlier to apply make-up. So, having pretty nails makes me feel feminine even when my face is bare. As a Woman, it's perfect. The endless design possibilities are mind-blowing. Choosing a new one every few weeks is hard! Oh gosh, life can be so tough (irony warning!). Moreover, I get pampered for a little over an hour on a regular basis, which has a huge feel-good factor. I've suffered from low self-image for most of my life (I'm very happy to say that I'm doing much better in that department! ), but I've always loved my nails. And I'll admit that I love the comments I get on each new set. I have to stay objective though, so on the down-side, getting a gel polish manicure is a money investment. There is no way I would be doing this so often if I hadn't found the lovely Sarah at Embellish Nails, who loves to pamper women at an affordable price. So I choose to use the little bit of spending money I have on cups of good coffee (I'm a coffee snob, but more on that in another post) and getting manicures. Beware! Not all nail artists use the right removal techniques. If they make you dip your whole hand or all fingers at once in the removal liquid, run for your life. Each nail should be filed, then individually wrapped with the removal solution and silver foil for no more than 5 minutes. I'm very intrigued by the Jamberry Nail Wraps that are taking the world by storm. I'm going to a demo party soon to check them out and I will report back. So, there you go. 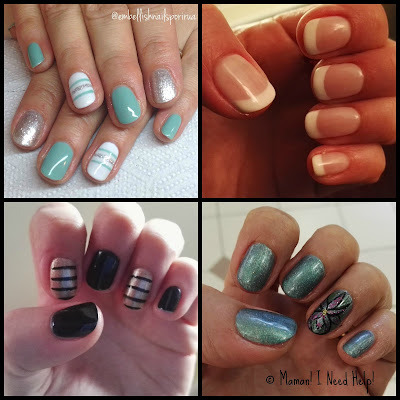 A whole post on nails. Do you get your nails done? If not, how do you like to make yourself feel special?